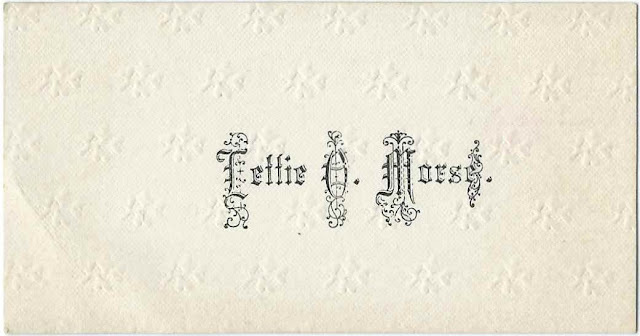 Calling card of Lettie O. Morse. Because the card was found with others from Franklin and Somerset Counties in Maine, Lettie was presumably Letitia Octavia Morse from Chesterville, Maine. Letitia Octavia Morse, "Lettie", was born about February 1861 at Chesterville, Maine, daughter of George Lamb Morse, Sr. and Susan Penney (Manley) Morse. On October 28, 1882 at Farmington, Maine, Lettie married Albertus Earl Currier, "Bert", son of Levi Prescott Currier and Julia Alice (Smith) Currier. Interestingly, another calling card in the collection bears the name of Noah C. Currier, who was a brother to Albertus Earl Currier. Lettie and Albertus, a stonecutter, made their home at New Sharon, Maine, where they raised several children. By 1920 they were divorced, and Lettie was living at Mount Vernon, Maine, with children. Lettie died in 1936 and is buried with family members in the Bean Cemetery at Mount Vernon, Maine. If you have corrections and/or additions to the information above, please leave a comment or contact me directly.